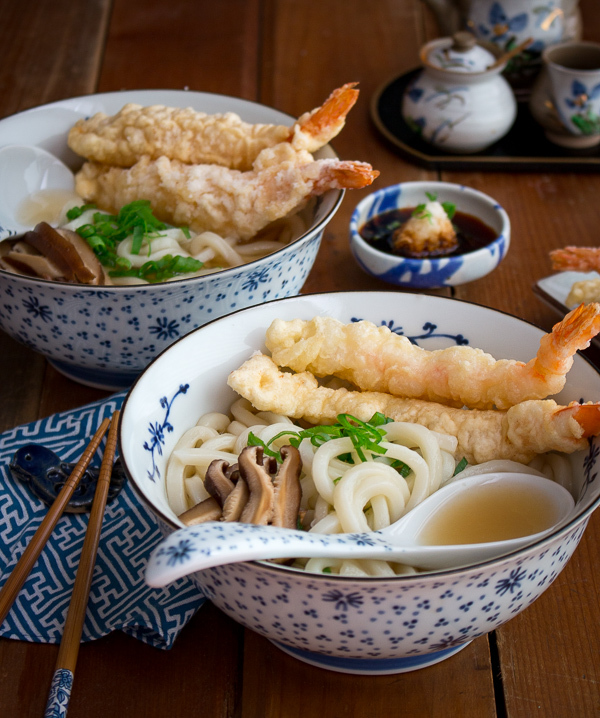 Shrimp Tempura Udon Noodles with slurping delicious shiitake dashi umami broth and light and crispy tempura fried shrimp is going to be your new favorite Japanese recipe. Step By Step Video Included! You are just going to love Shrimp Tempura Udon Noodles because it has comfort food written all over it. Super long aldente thick udon noodles and nourishing broth that is going to warm you all the way down to your soul is just what the doctor ordered. 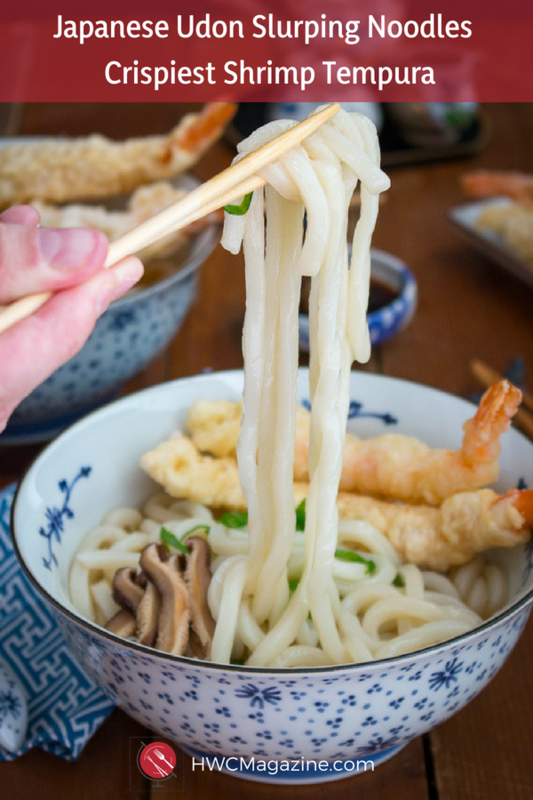 Shrimp Tempura Udon Noodles is the BEST go back to school recipe. 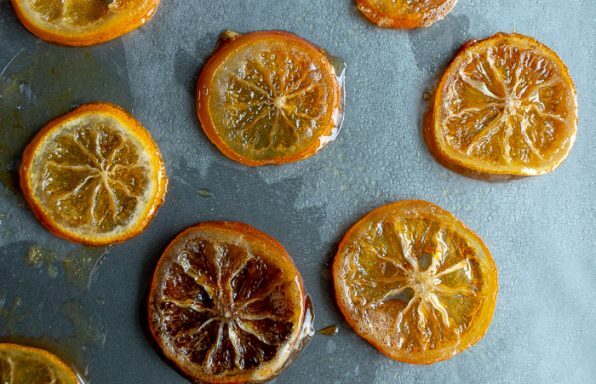 The kids just adore this recipe. Whether you’re a kid or an adult, what is not to love about these light and crispy tempura shrimp after you been at work or at school all day. With the start of the new school year there is always new friends and a whole new set of bugs to share as well. 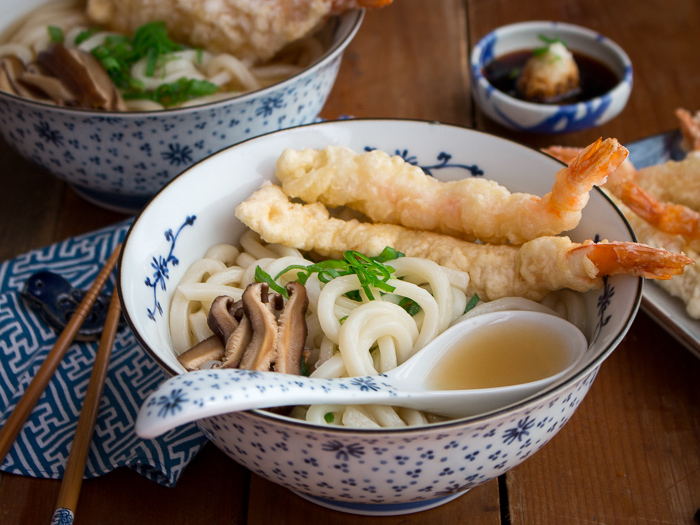 The kids start with their sniffles and coughs and a little Shrimp Tempura Udon Noodles will get them sorted right away. There is something so comforting and nourishing about udon noodles in that special broth. We are very excited to share with you that we are collaborating with All That’s Jas to bring to you a delicious noodle recipes from around the world once every month. How awesome is that! We cannot wait to try All That's Jas Caramelized Cauliflower and Mushroom Spaghetti recipe! If you make one of our noodle dishes or a noodle recipe of your own, please make sure you use the #NoodlesWithoutBorders hash tag on instagram. 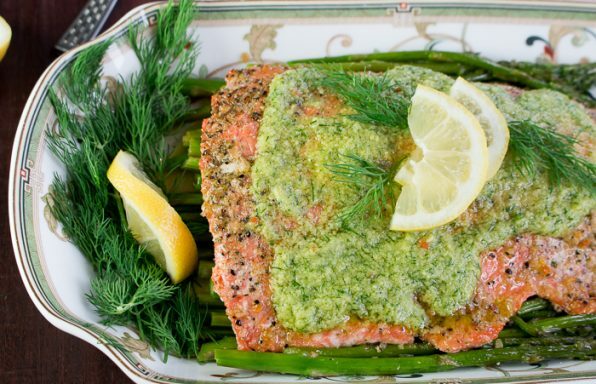 We love to see what you are making in your kitchen. Noodles are fantastic and every country has a recipe to celebrate the delicious slurpable noodle. What is your favorite noodle dish? Please leave us a comment below, if you have any special international noodle recipe requests. We just love slurping our noodles. In Japan, it is very common practice to hear people slurping up their noodles. Loud slurping may be rude in the U.S., but in Japan it is considered rude not to slurp your delicious noodles. So, slurp away dear friends! We use the special spoon to drink the broth and chopsticks to eat the noodles. Our Shrimp Tempura Udon Noodles are so long you can't help but slurp! Be sure to check out our How to Cook Shishito Peppers on the Grill, Negima Yakitori with Grilled Portabella Mushrooms and Pepper Lunch Steak Sizzle . Shrimp Tempura Udon Noodles are a Japanese thick wheat noodles. The udon noodles are white, long and thick. We bought our udon noodles in the Asian “frozen food section” in Kroger’s grocery store but also available in Asian food stores and many local groceries. The frozen udon noodles are very convenient as individual servings are frozen in sections and only takes 1-2 minutes in boiling water and you are done. Udon noodles can also be bought fresh or dried. We have also seen udon noodles just at your local Walmart. In addition, there are also gluten-free udon noodles available via amazon if you are celiac. (Kobayashi Noodle's Gluten Free Fresh Noodles are made from non-GMO 100% Japanese white rice or brown rice). The broth is the heart of this delicious udon dish. The shrimp tempura udon noodle broth was made simply with a little dashi, dried shiitake mushroom broth, tamari (soy) sauce and mirin. Dashi is a delightful cooking stock used in Japanese cooking and helps accentuate the umami flavor. Dashi usually contains dried bonito (dried fish), konbu (edible kelp), dried shiitake mushrooms and sometimes other dried fish like baby anchovies. You can find dashi in an Asian food store or buy online. The brand we used Is Anjinmoto Hondashi. We found this right at our local Kroger store and Walmarts. If you want to make vegan or cannot find dashi then use a vegetable broth and combine with the shiitake mushroom broth from rehydrating the dried shiitake mushrooms, add mirin and a little tamari or soy sauce. If you are celiac of suffer from gluten intolerance you will want to make the vegan version as dashi is not gluten-free. Mirin is a sweet cooking Japanese rice wine. Mirin is like sake but is sweeter. If you cannot find Mirin you can use a sweet marsala wine. Kikkoman makes a mirin type cooking wine called “Aji- mirin” which means tastes like mirin and it will do in a pinch. We have used Aji-mirin in our Shrimp Tempura Udon Noodles previously but we have noted that it is a little sweeter than real mirin rice wine. 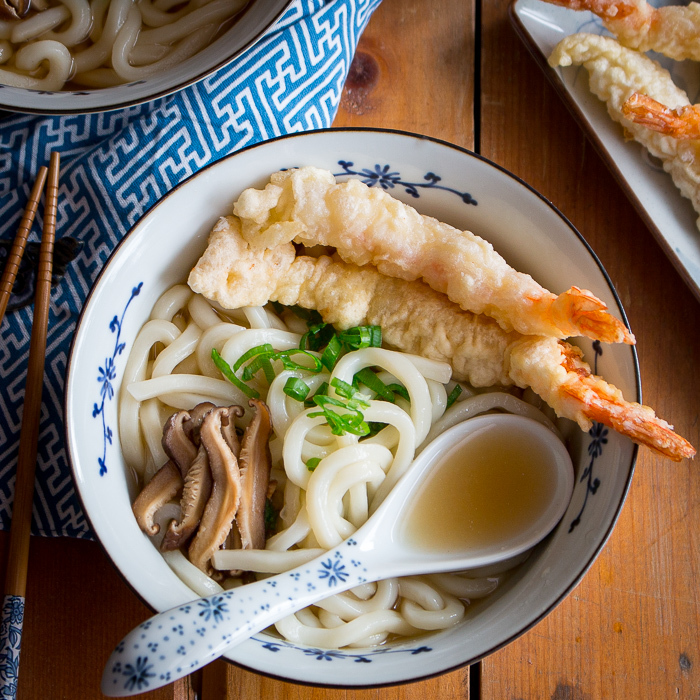 We used dried shiitake mushroom broth in our shrimp tempura udon noodle broth and it totally rocks. We found dried shiitake mushrooms in our local grocery store in the Asian food section. You can also buy online or an Asian food store. We placed a handful of dried shiitake mushrooms in a bowl and covered with boiling water and left it set for about 30 minutes until soft. We added this delicious shiitake mushroom broth in our soup broth and we diced the shiitake mushrooms in our soup as a garnish. 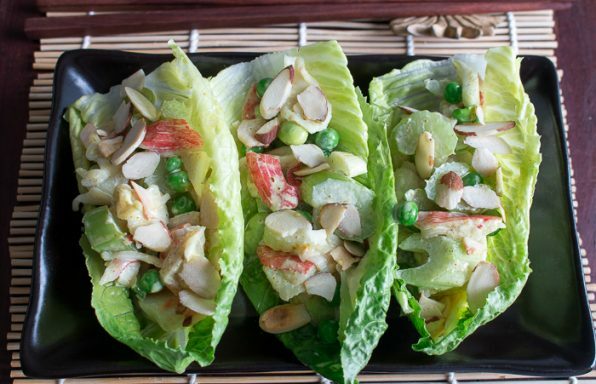 We love serving a little portion of our Lemon Diakon Refrigerator Pickles on the side. The udon noodles and soup broth come together in about 30 minutes but what is udon soup without the shrimp tempura? 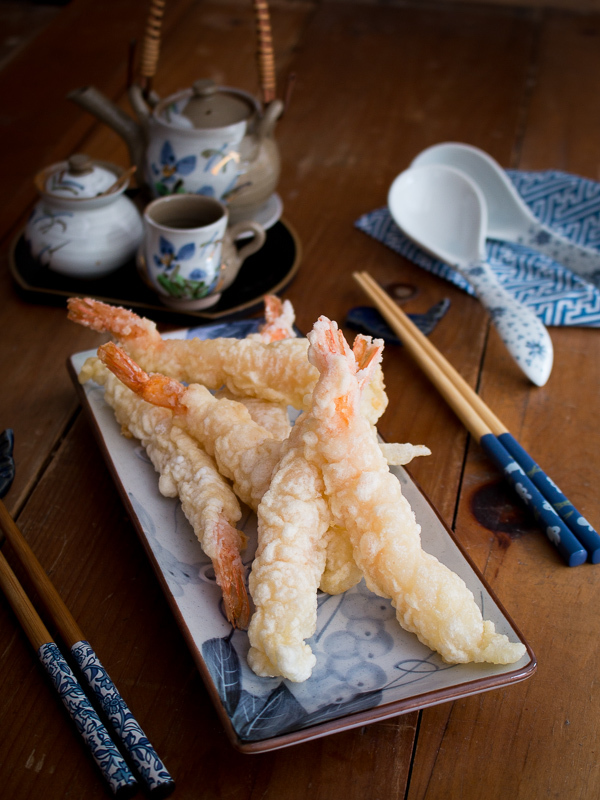 You are going to crave that crispy, light and completely addictive shrimp tempura. 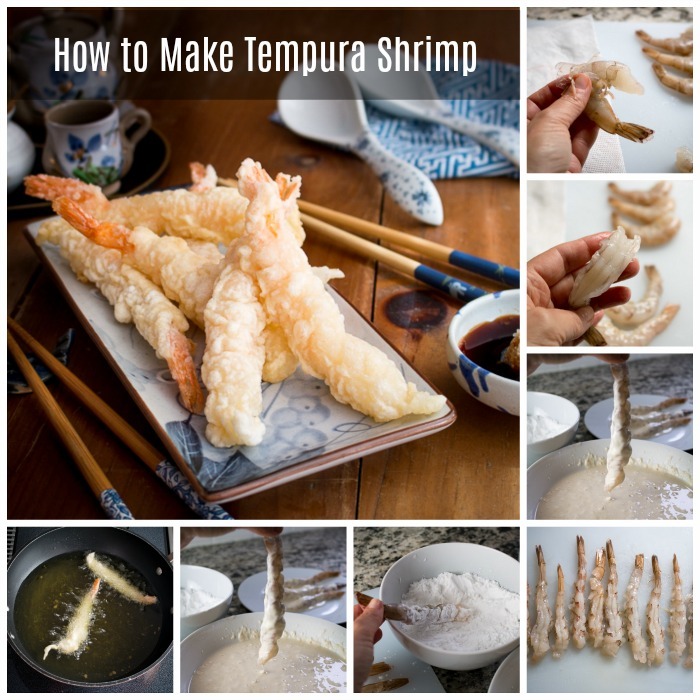 We have a few helpful hints to make your shrimp tempura making experience easier. We also have included a video to show you how to do it. Scroll down for the step by step video. Buy whole raw shrimp with the tail on. Leaving the tail on makes for a super cute shrimp tempura. Peel the shrimp but leave the tail on for aesthetic reasons. Scrape and remove the black from the tail as this helps prevent some of the splashing during the frying as the tail can hold hidden moisture. To make your shrimp long and straight, you need to make cuts diagonally in the shrimp on the underside about half way through the shrimp, be careful not to go all the way through. Check out the video below on how to do this. Next turn the shrimp with top side up and with your thumb and first 2 fingers on both hands gently press down until you hear that little cartilage crunch as the shrimp lengthens. Make sure your shrimp are dried super well. This is super important. Preheating your cooking oil to about 180 degrees C (360 degrees F). Your oil should sizzle when you put in a little bit of the tempura batter. Your oil should not be so hot that it is smoking. Place potato starch in one bowl and dip each shrimp inside. Next, dip each shrimp into prepared tempura batter. We used a premade tempura batter mix and mixed with super iced cold seltzer water. The reason why the water needs to be super iced cold as it prevents the gluten in the flour from activating. If glutens start to activate this can make the tempura batter tough or heavy. However, if you cannot find this then you can use cake batter, an egg and water/seltzer water instead. Do not overmix the tempura batter as this will cause the glutens to activate and make your batter tough. Just toss the tempura flour mixture and the seltzer water or water just until combined. It will still have lumps and that is perfect. Lumpy tempura batter is preferred. Keep your batter cool while frying your shrimp 1-2 at a time for about 1 minute. You will know when the shrimp are done as it will be completely crispy and the shrimp will be stiff and not limp when taken out of the oil. We put a bowl of ice under our tempura batter bowl to keep the batter cool. Do not over crowd your frying pan. We used our wok and you need to have at least 2 inches of cooking oil at the bottom. Be super careful and make sure that the younger kids steer clear of the kitchen and keep that handle safely off to the side. Be careful as you dip the battered shrimp carefully into the hot oil to fry. Drop the shrimp in and circle it around so that you lay it down in the oil going away from you. Do not overcrowd your frying vessel with too many shrimp at a time as this will lower the temperature of your oil and they may stick together. It goes fast so just do 1-2 at a time. Vegans, no problem as many low moisture vegetables are super delicious fried in tempura. Be sure to try thin slices of sweet potato, onion, bell peppers and asparagus. All these vegetables are super delicious. We always season our tempura with a little salt immediately upon coming out of the fryer. 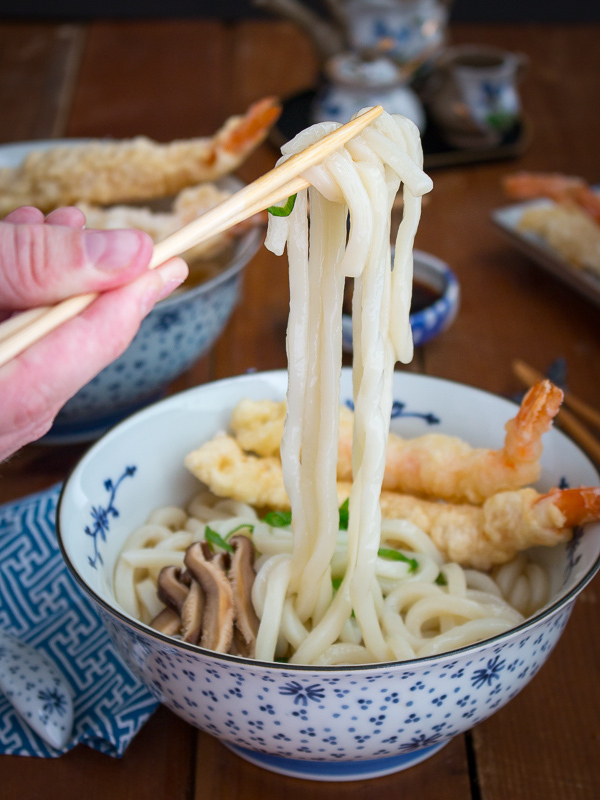 We hope you enjoy trying this nourishing Shrimp Tempura Udon Noodles recipe. Don't forget to tag us with #NoodlesWithoutBorders if you make this recipe or any noodle recipe. We love to see what you are making. Oil for deep frying – use a light flavored oil like vegetable or canola and enough to be at least to be 2 inches deep in the cooking vessel of choice. 1Prepare the Udon noodle broth - Pour boiling water over your dried shiitake mushroom, enough to cover and steep for about 30 minutes to allow to soften. Do NOT throw away the shiitake broth as this will be used in the soup broth. Remove the stems from shiitake mushrooms and slice thinly to use as a garnish for your soup. Set aside. 2In a pot add your shiitake mushroom broth, water, dashi (if making vegan gluten free vegetable broth), mirin, tamari (soy) sauce and salt to taste over medium heat for about 10 minutes – keep warm. 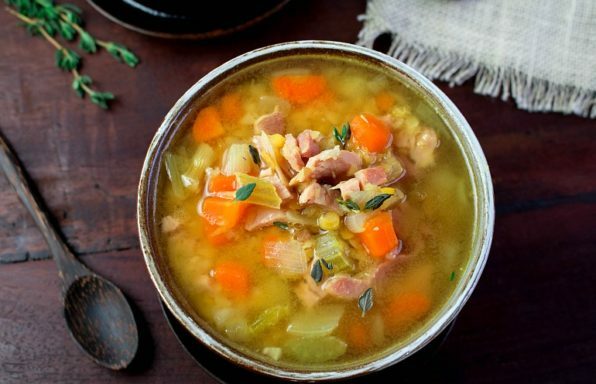 Skim the film off the top of the soup. 3Boil your udon noodles in salted water for 2-3 minutes per package instructions and then rinse with cool water and set aside. 4Prepare your shrimp- Peel your shrimp but leave on the tail. Remove the black/white vein from the back of the shrimp by running your knife along the back of the shrimp just and pull out the vein and discard. Lay your shrimp on its side and scrape any remove the black from the tail of the shrimp. 5Make the shrimp long and flat - Lay the shrimp belly side up and make several horizontal slits about 1/8 apart only about half way through the shrimp. Be very careful to not cut all the way through. Then take the shrimp and flip over so the back side is up on top and lay flat on your working surface. Take your thumb and your pointer and middle finger and press down slightly to make flat. You will hear a slight crunch and that is exactly the effect you are going for. 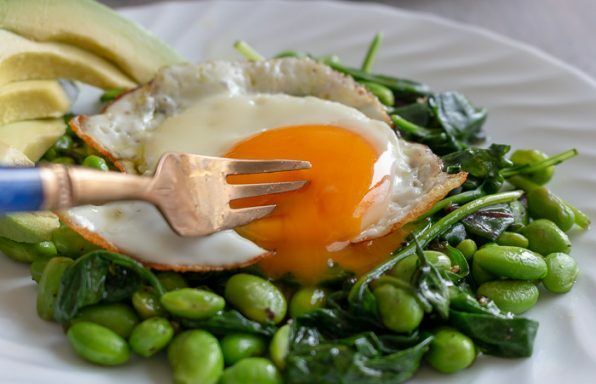 You want to break down the proteins so they lay flat and stay flat and long during the cooking process. Rinse the shrimps and dry extra good with a paper towel. You need to get the shrimp EXTRA dry! 6Add cooking oil to your cooking vessel of choice. You need to make sure that the oil is at least 2 inches deep. Preheating your cooking oil to about 180 degrees C (360 degrees F). Your oil should sizzle when you put in a little bit of the tempura batter. Your oil should not be so hot that it is smoking. 7In the meantime, prepare your tempura shrimp assembly line. 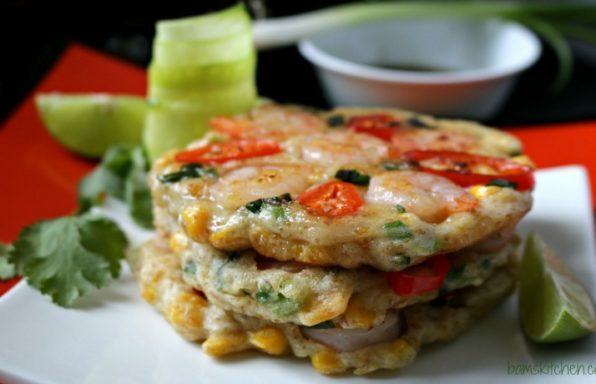 Place ½ cup potato starch or cornstarch in one plate and set aside. Prepare your tempura batter. In a medium bowl add the other ½ cup of potato starch, ½ cup cake flour/00 flour (if need to be gluten free, try rice flour), 1 beaten egg and 1 cup extra cold seltzer water or just regular water. Mix, so very gently just to combine the big lumps but essentially it should be very lumpy and just barely combined and then it is perfect. Get this tempura batter on top of a larger bowl filled with ice to keep it cold. (if your batter gets warm it activated the glutens and this results in a tough batter and you want yours to light and crispy) You should now have in front of you your prepared shrimp, a plate of potato/corn starch for dusting, prepared tempura batter sitting over a bowl of ice and ready to go hot oil in your pan for frying. 8Double check your oil to make sure it is ready to go. Place a little bit of the prepared tempura batter into your frying pan and if it sizzles you are ready to go. 9Dip your shrimp into the potato starch/ corn starch to dust on all side and shake off the excess. Next dip your shrimp into the wet tempura batter on all sides and then slowly and carefully place your shrimp into the hot oil for frying. Fry the shrimp for about 1 to 1.5 minutes. You will know when your shrimp are done because then you pick up the shrimp they will be crispy on all side and the shrimp will stay firm and will not limp. If your oil is not hot enough, you will end up with a soggy shrimp and if the oil is too hot your shrimp will be tough. Remember you are looking for a 180 degrees C (360 degrees F) oil and your shrimp should sizzle aggressively when placed in the oil. 10Remove the shrimp on to a plate lined with paper towels to drain and season with salt to taste. 11Serving up your Shrimp Tempura Udon Noodle bowls. Place your cooked udon noodles into a serving bowl, ladle over the hot broth, garnish with sliced shitake mushrooms, sliced green onions and shrimp tempura. 12We like to make extra shrimp tempura on the side and we serve with our dipping sauce. Mix water, dashi, tamari, mirin and grated daikon. Dip the prepared tempura shrimp into the dipping sauce and enjoy!